Now this food adventure was truly a walk down memory lane - a road that has now been overgrown with weeds because it has been that long. 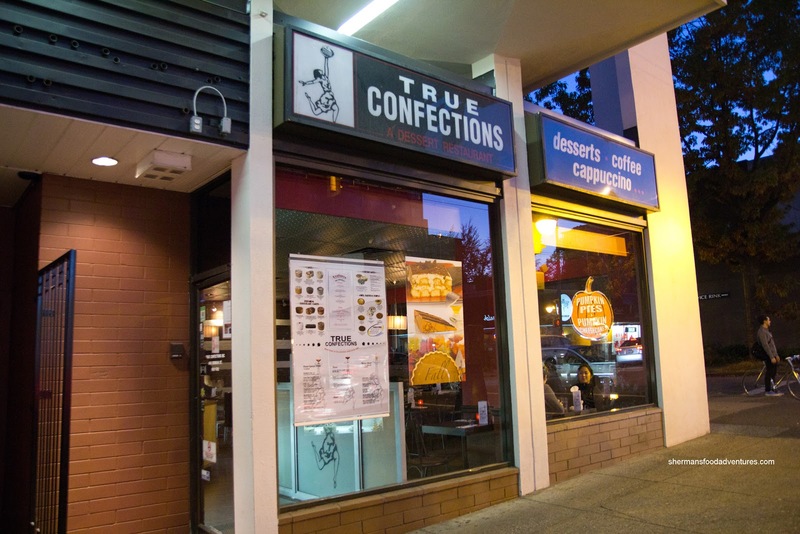 Way back in our University days, Viv and I along with Costanza and Elaine would frequent True Confections for our late night dessert run. Yes, there was not a whole lot of choice back then and in fact, there still is not much choice in terms of late night sweets. Our dessert reminiscing was a not a result of a planned visit, rather, we were just fresh from eating at Hapa Izakaya (which was another ol' hangout, albeit not as long ago!). Seemingly like time never changed, Costanza had the Chocolate Cake (like he always did). 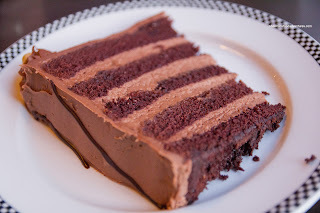 Too bad, time has passed and eating chocolate cake only adds to the beer gut... Anyways, the cake was decently moist while chocolatey in a sweet kinda way. It wasn't heavy despite the visuals. 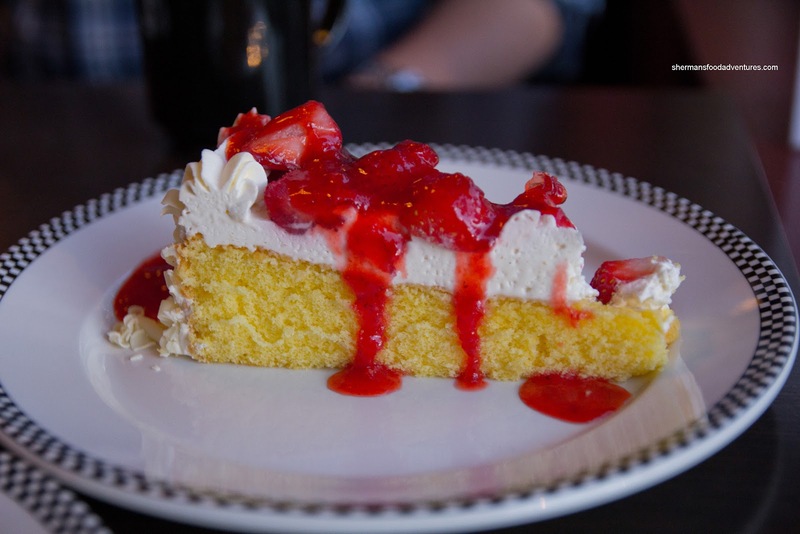 For myself, I had the classic Cheesecake with strawberries. 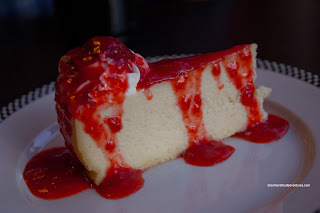 This was a typical New York-style cheesecake where it was firm and dense. I personally like this version, however, I found this one to be rather inconsistent in texture. There were some hard parts mixed in with some fluffier portions. Naturally, the top, bottom and side would be more stiff, but I already took that into account. I did appreciate it wasn't too sweet nor was there a crust. I like more cheesecake and less crust! Viv went for the Flan and it was more of a cake with whipped cream and strawberries. Again, we appreciated that it wasn't too sweet. It was light and pretty refreshing as a dessert. Despite not being a "deluxe" dessert joint, True Confections pretty much satisfies most people because frankly, they are not that picky. However, for those dessert aficionados, the offerings at True Confections could be classified as plain and unrefined. For me, it did the job and it wasn't too expensive. True Confections was also a bit of a hangout for me in the university days (Alma & Broadway), but rarely did I go there just for desserts as I didn't have such a sweet tooth then like I do now :-) The Denman location was convenient if/when we were still hungry after a late-night prowl at The Fresco Inn (mushroom burger & fries for $5 ! ), whose desserts were kinda meh for their prices.